^ 1.0 1.1 1.2 1.3 1.4 1.5 1.6 1.7 Hutter, Manfred. 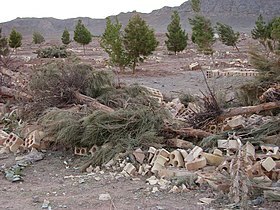 Bahā'īs. (编) Jones, Lindsay. Encyclopedia of Religion 2 2nd. Detroit, MI: Macmillan Reference USA: 737–740. 2005. ISBN 978-0-02-865733-2. ^ 3.0 3.1 The Bahá'í Faith. Britannica Book of the Year. Chicago: Encyclopaedia Britannica. 1988. ISBN 978-0-85229-486-4. ^ Stockman, Robert. Jesus Christ in the Baha'i Writings. Baha'i Studies Review. ^ `Abdu'l-Bahá. Some Answered Questions Softcover. Wilmette, Illinois, USA: Bahá'í Publishing Trust. 1990: 113. ISBN 978-0-87743-162-6. ^ 13.0 13.1 Masumian, Farnaz. Life After Death: A study of the afterlife in world religions. Oxford: Oneworld Publications. 1995. ISBN 978-1-85168-074-0. ^ 15.0 15.1 Principles of the Bahá'í Faith. bahai.com. 2006-03-26 [2006-06-14]. ^ Dewey, J.J. The Three Revelations. The Gathering of Lights. 1999. （原始内容存档于2007年2月12日）. ^ Taherzadeh, Adib. 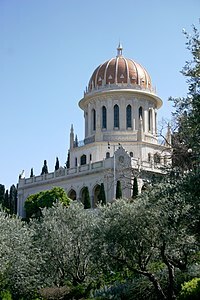 The Covenant of Bahá'u'lláh. Oxford, UK: George Ronald. 1972. ISBN 978-0-85398-344-6. ^ 18.0 18.1 Momen, Moojan. Covenant, The, and Covenant-breaker. [2006-06-14]. ^ Taherzadeh, Adib. 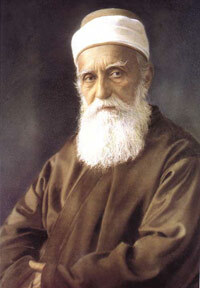 The Revelation of Bahá'u'lláh, Volume 4: Mazra'ih & Bahji 1877-92. Oxford, UK: George Ronald. 1987: 125. ISBN 978-0-85398-270-8. ^ Winter, Jonah. Dying for God: Martyrdom in the Shii and Babi Religions. Master of Arts Thesis, University of Toronto. 1997-09-17. ^ 24.0 24.1 24.2 Balyuzi, Hasan. `Abdu'l-Bahá: The Centre of the Covenant of Bahá'u'lláh Paperback. Oxford, UK: George Ronald. 2001. ISBN 978-0-85398-043-8. ^ 25.0 25.1 25.2 Baha'-allah. Encyclopædia Iranica. 1989. ^ Stockman, Robert. Bahá'í Faith: A portraint. (编) Joel Beversluis (ed). A SourceBook for Earth's Community of Religions. Grand Rapids, MI: CoNexus Press. 1995. ^ 34.0 34.1 Universal House of Justice. 17 January 2003 letter. bahai-library.org. 2003-01-17 [2006-06-15]. ^ 35.0 35.1 35.2 Universal House Of Justice. Five Year Plan 2006-2011. West Palm Beach, Florida: Palabra Publications. 2006. ^ Bahá'í International Community. Worldwide Community. Bahá'í International Community. 2006 [2006-05-31]. ^ 37.0 37.1 Encyclopædia Britannica. Worldwide Adherents of All Religions by Six Continental Areas, Mid-2002. Encyclopædia Britannica. 2002 [2006-05-31]. ^ adherents.com. Major Religions of the World Ranked by Number of Adherents. adherents.com. 2002 [2005-08-28]. ^ World Book editors (编). The World Book Encyclopedia: 2003 ed edition. World Book Inc. 2002. ISBN 978-0-7166-0103-6. ^ Paul Oliver. Teach Yourself World Faiths, New Edition. McGraw-Hill. 2002. ISBN 978-0-07-138448-3. ^ Barrett, David A. World Christian Encyclopedia. 2001: 4. ^ FP Magazine. The List: The World’s Fastest-Growing Religions. FP. May 1, 2007 [May 5, 2008]. ^ Universal House of Justice. Letter to a National Spiritual Assembly. bahai-library.org. 1991-12-09 [2006-07-11]. ^ Walbridge, John. Prayer and Worship. 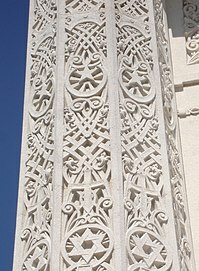 bahai-library.org. 2006-03-23 [2006-07-11]. ^ 46.0 46.1 Local Spiritual Assembly of the Baha'is of Warwick. Baha'i Marriage. Bahá'ís of Warwick. 2003-10-12 [2006-06-14]. ^ 50.0 50.1 Bahá'í International Community. History of Active Cooperation with the United Nations. bahai.org. 2006 [2006-06-15]. ^ Bahá'í World News Service. Bahá'í United Nations Representative Addresses World Leaders at the Millennium Summit. 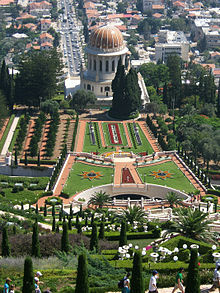 Bahá'í International Community. 2000-09-08 [2006-06-01]. （原始内容存档于2006-04-22）. ^ adherents.com. 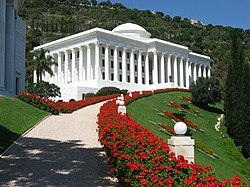 Baha'i Houses of Worship. adherents.com. 2001-05 [2006-06-14]. 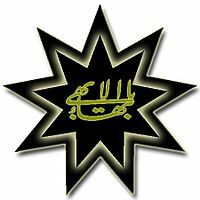 ^ Faizi, Abu'l-Qasim. Explanation of the Symbol of the Greatest Name. Bahá'í Publishing Trust, PO Box No. 19, New Delhi, India. 1968. ^ 57.0 57.1 International Federation for Human Rights. Discrimination against religious minorities in Iran (PDF). fdih.org. 2003-08-01 [2006-10-20]. ^ 58.0 58.1 58.2 Egyptian Initiative for Personal Rights. Government Must Find Solution for Baha'i Egyptians. eipr.org. 2006-12-16 [2006-12-16]. （原始内容存档于2007-02-09）. ^ Netherlands Institute of Human Rights. Iran, Islamic Republic of. Netherlands Institute of Human Rights. 2006-03-08 [2006-05-31]. （原始内容存档于2006-05-02）. ^ Bahá'í International Community. Bahá'í International Community dismayed at lack of Human Rights Resolution on Iran. Religion News Service. 2005-04-14 [2006-03-08]. （原始内容存档于2006-02-21）. ^ 61.0 61.1 Asma Jahangir. Special Rapporteur on Freedom of religion or belief concerned about treatment of followers of Bahá'í Faith in Iran. United Nations. 2006-03-20 [2006-06-01]. ^ Michael Rubin. Iran Means What It Says. Middle East Forum. 2006-01-25 [2006-06-01]. ^ BBC News. The press in Iran. BBC News. 2005-08-16 [2006-06-01]. ^ Bahá'í International Community. Summary and Analysis of Recent Media Attacks. Bahá'í International Community. 2006 [2006-06-01]. （原始内容存档于2006-06-19）. ^ 美国参考. 国际社会谴责伊朗对巴哈伊教人士判刑. American.gov. 2010-08-17. （原始内容存档于2010-08-28）. Britannica. The Bahá'í Faith. Britannica Book of the Year. Chicago, IL. 1992. ISBN 978-0-85229-486-4. Esslemont, John. Bahá'u'lláh and the New Era 5th revised. Wilmette, IL: Bahá'í Publishing Trust. 1980 . ISBN 978-0-87743-160-2.